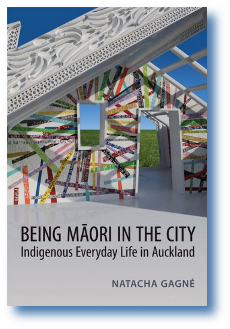 Toronto, University of Toronto Press, , 368 p.
One of the first ethnographic studies of Māori urbanization since the 1970s, this book is based on almost two years of fieldwork, living with Māori families, and more than 250 hours of interviews. In contrast with studies that have focused on indigenous elites and official groups and organizations, Being Māori in the City shines a light on the lives of ordinary individuals and families. Using this approach, Natacha Gagné underlines how indigenous ways of being are maintained and even strengthened through change and openness to the larger society. University of Toronto Press, Scholarly Publishing Division, 2012, 368 pages. ISBN 9781442614130 (paper, 32,95 $) 9781442645929 (cloth, 70 $). "Natacha Gagné is a gifted writer who has conducted excellent fieldwork and data assembly for this book. She provides a valuable corpus of knowledge by which to test and compare Māori and indigenous urban-life circumstances cross-culturally and cross-generationally. As such, Being Maori in the City could become a pivotal publication on which much needed future scholarship can develop." "Being Māori in the City is a serious advance in state-of-the-art research, re-invigorating New Zealand anthropology as it explores the realities of urban life for Māori today. Combining the intimacy of long-term participatory research with the relative objectivity of an informed, well-trained anthropologist, Natacha Gagné proves that this classic anthropological approach is the discipline at its best. Her book makes an important contribution both to Māori studies and to urban anthropology in New Zealand, adding significantly to an area that has been little explored in social anthropology." "In this informative book, Natacha Gagné uses the framework of ‘universes of meaning’ to understand the wide and diverse sets of urban-based Māori relationship dynamics. This method captures and contextualizes the different situations of identity-dynamics quite effectively, and it will make this book of interest to those in a wide range of academic disciplines."